The Cumberland & Dumfriesshire Farmers Mart had forward 5,693 Store Lambs (including 1,920 Cheviots & 1,210 Blackfaces) at their Weekly Sale at Longtown on Tuesday 11th October, 2011. All classes at extreme rates, with many distant buyers present for the first time this year. Top of £89 and £78 for Texels from Linton House, £77.50 Rinnion Hills and Cherry Garth; Beltex £80, £79, £77.50 Greenknowe; North Country Cheviot £72 Rosebank, £65 Humbleheugh, £63.50 Sorbietrees; Suffolk £68.50 Knells, £67.50 Dyke and High House; Cheviot Mule £68 Powisholm; Greyface £67 Allensgreen, £62 Tecket; Charollais £58.50 West Hills; Swaledale £45.50 Cottage Farm, £43 Sheepriggs. Cast ewes to £77 Linton House, who sold cast rams at £91. Hill Cheviots much sharper. Top of £62.50 Windyhaugh, £60.50 Glendinning, £59.50 Hartsgarth and Crossdykes. Cheviot ewe lambs to £63.50 Sundhope. Blackface lambs met a similar trade. Top of £60 Allensgreen, £54 Bowan Hill, £53 Dunblane. Ewe lambs to £64.50 Sundhope. The Cumberland & Dumfriesshire Farmers’ Mart P.L.C. 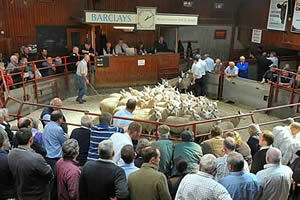 held their Second Main Sale for Hill Ewes and Late Sale for Breeding Sheep of all other classes at Longtown on Tuesday 11th October 2011. Trade remained buoyant throughout with a packed ring of buyers ensuring a firm trade all day. In the Hill Ewe section a top of £120 was achieved for a pen of Blackface shearlings from Whitslade and in the Lowland section to a top of £240 for Texel shearlings from Philiphaugh. Texel - £135 Philiphaugh, £130 Hillhead, £128, £122, £118 Philiphaugh. Suffolk cross - £105, £102 Philiphaugh. Greyface - £104 Moss Side, £102, £100 Branteth. Cheviot Mule £100 Skelfhill, £92 Linton House. Swaledale - £100 Bayles, £75 Cottage, £74 Spoutbank. North Country Cheviot - £92 Stackbraes, £75, £74 Linton House. Blackface - £84 Skelfhill, £75 Bowan Hill and Collin Bank. Lleyn - £82 Sloda Hill. Hill Cheviot - £80 Arkleton, £74 Stackbraes, £71 Scarthlees. Texel - £240, £200, £175, £170, £165, £150, £145 Philiphaugh, £126 Hillhead. Greyface - £128 Barron House, £112 Stackbraes, £104 Kilncroft. Blackface - £120 Whitslade, £88 Chapel and Whitslade. Swaledale - £116 Bayles, £86 Dumblar Rigg. Cheviot Mule - £108 Skelfhill. Hill Cheviot - £89 Stackbraes. Charollais - £76 Dumblar Rigg. Lleyn - £70 Sloda Hill. Texel - £116 Kirkton, £105, £100 Philiphaugh, £100 Kirkton, £95 Philiphaugh and Kirkton. Greyface - £77, £76 Ramshope, £75 Barnshangan. Cheviot Mule - £68 Chapel, £63 Smiddyhill. Blackface £64 Sundhope, £57, £56.50, £55.50 East Fortissit. Suffolk cross - £64 Hazelbank. Hill Cheviot - £58 Windyhaugh. North Country Cheviot - £55 Whitefield. The Dispersal of The Gorrenberry, Newcastleton Stock Sheep created a lot of interest from buyers near and far. The sheep on offer were shown in first class condition, trade was excellent throughout. Top of £80 for Hill Cheviot gimmers, 1 crop £62, 2 crop £72, 3 crop £66, mixed ages £69, ewe lambs £60. Blackface 1 & 2 crop £68, 3 & 4 crop £58.